Every year there are many domain owners that get conned into paying for domain name related services that will offer them no benefit. There are many scams out there and recently a client contact me about an email that they received (that they paid) relating to their domain name. 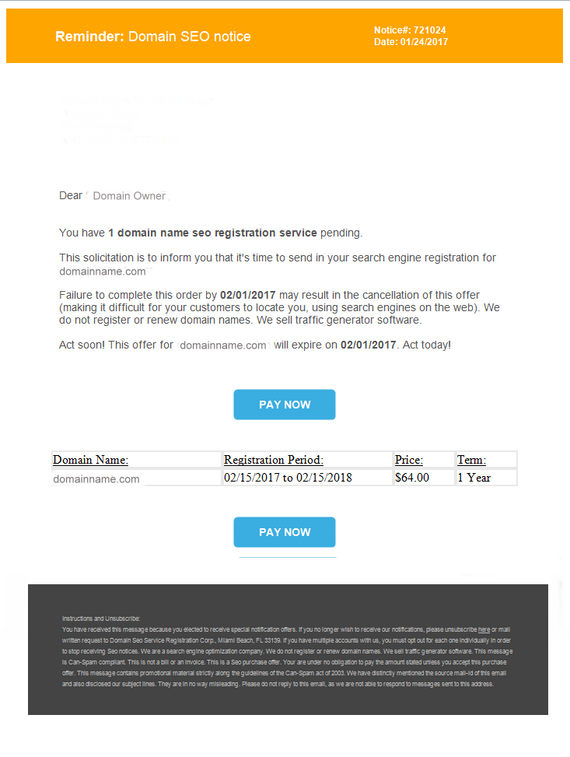 This scam relies on people not thoroughly reading the email and just jumping to the conclusion that their domain is going to expire or services relating to the domain are about to expire and that they need to renew the service as soon as possible as soon as possible. Note: there is also another variation on this scam that sends out notifications via regular mail and again relies on the domain owner not reading the letter properly because it is offering to register their domain name. If read carefully the domain owner will see that it is a variation of the domain that they own For example if they own mydomain.com.au the notification may relate to www.mydomain.com or www.mydomain.net and they are asking you to pay about $257 for something you don’t need and you will not get any benefit from. If you are launching a new Project or if your website needs rebuilding?